My name is Iris Munguía. I am from Honduras, I am a member of the Women’s Secretariat of the Federation of Agricultural Unions, and I am also coordinating a project at the regional level through the Latin American Coordinator for Banana and Agricultural Unions (COLSIBA, in Spanish initials). The COLSIBA include all the countries in Central America, as well as Ecuador and Peru. Through it, we’re coordinating with worker’s organisations in the agricultural sector across the region. Penelope Kyritsis (oD): Why is gender-based violence a problem for women in the industry? Iris: We believe that women in the agricultural sector experience gender-based violence and discrimination at the social, labour and union levels. For example, sexual assault is common in plantations. Also, there is a wage differential between what a man and a woman can earn, even if they perform the same tasks. Another situation we’ve noticed is that, in recent years, the sector has been employing fewer women. I don’t know if this is due to the added production costs of maternity and lactation. These are problems that we’re very concerned about. Additionally, when women want to organise a union they are fired. There are examples from our countries, particularly from the melon plantations, where there are no unions. We are also advocating for unionisation in that sector since the lack of protection also constitutes gender-based violence. Despite ILO Conventions 89, 98 and 111, which address gender-based discrimination, these problems continue in our countries. Penelope (oD): Do these women have resources to respond to the problem, or any way to report gender-based violence? Iris: It is very difficult for women in the sector to report sexual assault. If the women haven’t been educated, if they have don’t have the foundation, it is unlikely that they will come forward. Sexual assault is principally an act that cannot be proven; it’s the woman’s word versus that of her aggressor, and generally these are in a more powerful position than the woman worker. Women feel empowered to denounce sexual assault when we start training ourselves, when we start talking about self-esteem and gender and women’s leadership. This leads women to sometimes yield to this kind of sexual assault, particularly when they don’t have a union to turn to. These cases, however, also happen when there is a union, since it’s so common for women to feel like they can’t come forward and denounce their aggressor. Women feel empowered to denounce sexual assault when we start training ourselves, when we start talking about self-esteem and gender and women’s leadership. Through that work, we start losing the fear and we start feeling empowered to come forward. Otherwise, it doesn’t happen. And many times, women are economically dependent because they earn meagre salaries and need to stay employed. In such situations, women may not challenge the actions of their male superiors. Penelope (oD): What can the Honduran government do to support these women? Iris: I think that the Honduran government is hardly doing anything to address the problem. 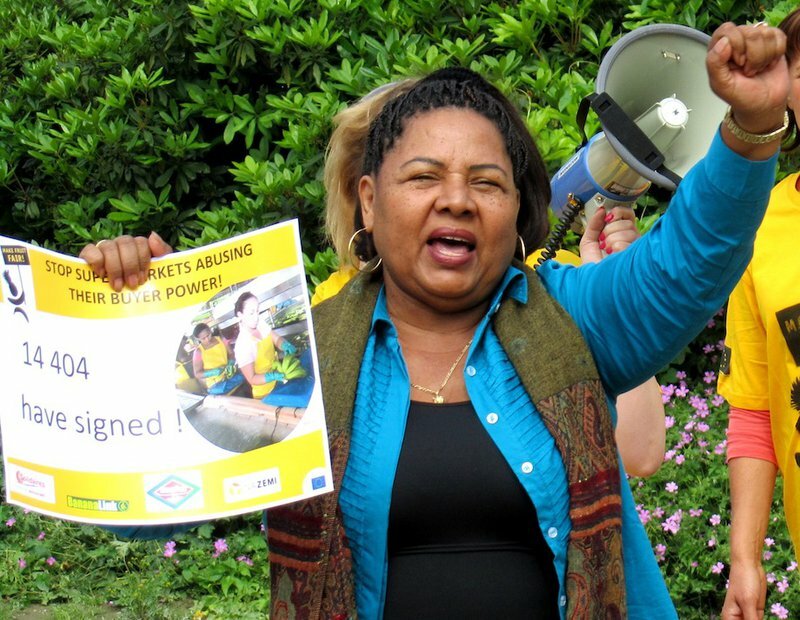 Even though there are specific ILO Conventions, and even though there is a law titled the Equal Opportunity Law in Honduras – which specifically addresses women workers, and for which we fought to get approved – there are still very few initiatives directed at addressing gender-based violence. We also believe that people can support us from outside Honduras. On 24 May, we had the opportunity to talk to US congressmen about this problem. The free trade agreement that the United States has with our countries includes a chapter – chapter 16 – which mandates that workers’ rights be respected. There is also ILO Convention 111, which, like I mentioned earlier, addresses workplace discrimination against women. Thus, we think that people here should keep track of the work that’s being done in Honduras since is it is happening through the framework of the free trade agreement and ILO Conventions. That’s one of the ways that people can support our work for women’s labour rights in my country. Penelope: What can we do at the international level to support these women? Iris: It seems to me that people should closely follow the work that we’re doing. We are also advocating at the ILO. The Agricultural Union (SDAS, in its Spanish initials) that advocates for the women working in melon farms in Honduras will be submitting a formal complaint to the ILO. In June, when our country’s representatives attend the ILO meeting, one of them will officially submit this formal complaint. And like I said earlier, we’re also taking our complaints to the United States. We told commerce and labour representatives here that it would be excellent if they could monitor and track the inspection law, a legal process that addresses our formal complaints. This inspection law will help the Honduran Ministry of Labour to document the violations happening across workspaces. I believe that much can be done internationally, as the framework created by free trade agreements allows outside groups to influence the authorities in our country.